Introduction: Laparoscopic ventral hernia repair (LVH) requires several skin incisions for trocar placement. We have developed a single incision approach to LVH repair. The technique was introduced in clinical practice to any consenting patients who were candidates for a standard multi-port laparoscopic hernia repair. A consecutive series of patients were then followed to evaluate feasibility. 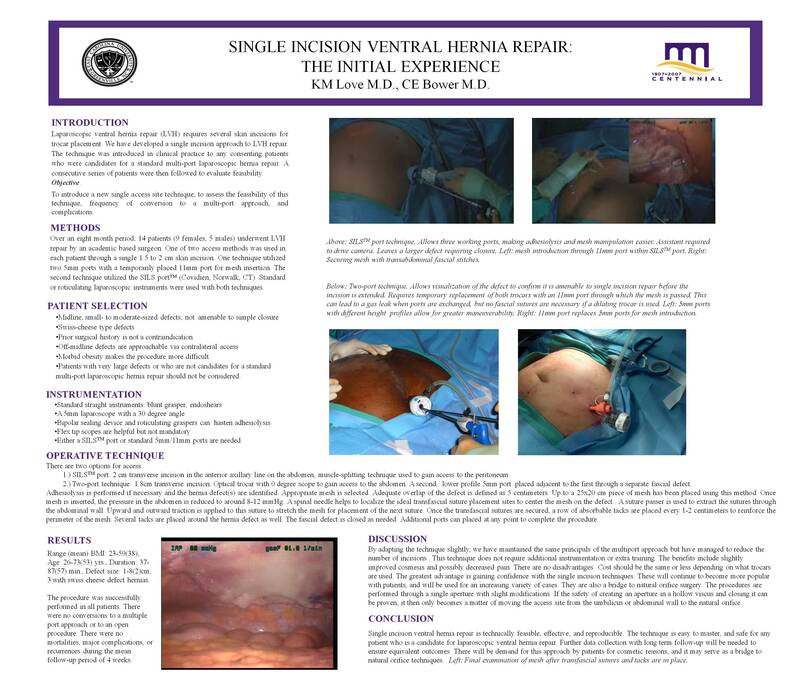 Methods: Over an eight month period, 14 patients (9 females, 5 males) underwent LVH repair by an academic based surgeon. One of two access methods was used in each patient through a single 1.5 to 2 cm skin incision. One technique utilized two 5mm ports with a temporarily placed 11mm port for mesh insertion. The second technique utilized the SILS port™ (Covidien, Norwalk, CT). Standard or roticulating laparoscopic instruments were used with both techniques. Defect size: 1-8(2)cm, 3 with swiss cheese defect hernias. The procedure was successfully performed in all patients. There were no conversions to a multiple port approach or to an open procedure. There were no mortalities, major complications, or recurrences during the mean follow-up period of 4 weeks. Conclusion: Single incision ventral hernia repair is technically feasible, effective, and reproducible. The technique is easy to master, and safe for any patient who is a candidate for laparoscopic ventral hernia repair. Further data collection with long term follow-up will be needed to ensure equivalent outcomes. There will be demand for this approach by patients for cosmetic reasons, and it may serve as a bridge to natural orifice techniques.